Shopping doesn’t need to involve long car or train journeys to massive out of town centres this festive season because there are a delightful variety of shops on our doorstep in some of our very own beautiful towns and cities. Features Writer Rob Bullock looks at how we can make shopping an enjoyable experience by keeping it local. This beautiful Dales village right on the edge of our area has some lovely shops and boutiques where you can find unusual presents for loved ones and some of the best seasonal food our area has to offer. Parking is easy and just a stone’s throw from the centre of the village. All of this under the impressive shadow of Ingleborough. Set just off the A65, there is lots to do and see in the village. Why not combine a spot of shopping with a meander around the town’s waterfalls followed by lunch in one of the pubs beside a roaring log fire. If you don’t fancy a pub lunch, the village is blessed with some nice cafés and tea rooms where you can revive with a hot brew and a home-made cake. Shopping in Carnforth really brings it home to you why you shop local. If you are coming from the south the views across Morecambe Bay are stunning. Parking is easy and everywhere is just a short walk away. There are two well-stocked small supermarkets where the staff couldn’t be more helpful and a good variety of small shops and salons reminding you that you don’t need to go to Liverpool or Manchester for fashionable clothes or the best beauty treatment. If you have the doggies with you, why not take a short diversion at Bolton le Sands and give them a walk on the shore, the views are terrific and there are a couple of delightful places to stop for a reviving hot drink. 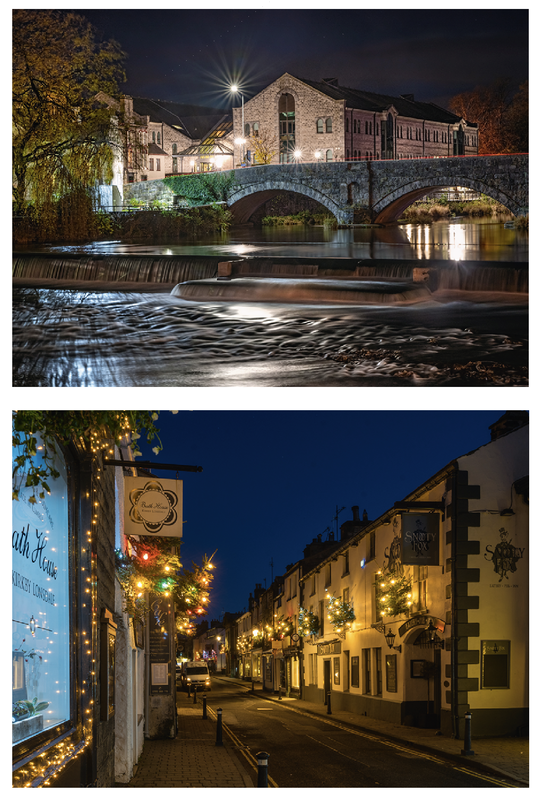 This lovely south Cumbrian town really looks a treat all dressed up for the festive season. And with three supermarkets, DIY superstores and department stores as well as the smaller independent shops you can get absolutely everything you want in Kendal. The car parking is central and allows easy access to the shops and the pretty narrow streets. Christmas lights create a magical atmosphere to help you enjoy your seasonal shopping. There are some excellent art shops in Kendal and these offer some unique gift ideas from local artists and craftspeople. Eateries are everywhere in Kendal offering a range of snacks and meals to meet every budget and dietary requirement. Quaint shops dot the main street of Kirkby Lonsdale making it a destination for festive shoppers from across the north during the month of December. The town’s Christmas lights are a real sight to behold. It even hosts its very own festive weekend with a Christmas Market which is the highlight of the town’s year though it is probably the busiest weekend of the year with thousands flocking in. Thursday is market day in Kirkby Lonsdale and there are a delightful variety of stalls congregating in the picturesque market square to supplement the excellent variety of shops and boutiques. The indoor Country Market in the Institute also takes place on a Thursday morning from 10 until 12 noon where you can buy homemade produce (cakes, jewellery, eggs, plants depending on the season) and sample homemade cakes and teacakes as well as a hot drink. Everything is so close at hand in Lancaster and there is a good mixture of larger chains and small independent shops for you to peruse at your leisure. Lancaster might be a small city but it is a vibrant place to enjoy festive shopping as you meander along its mixture of ancient and modern streets. Shopping destinations within the city include Marketgate Shopping Centre and St Nics Arcade which have got all you need under one roof including fashion, beauty, gifts, food and drink. Those visitors looking to experience something unique should visit one of the many independent shops throughout the city which include fashion retailers, jewellers, gift shops, art galleries and various food and drink establishments to suit all tastes. If you are lucky enough to be visiting Lancaster on a Wednesday or Saturday you can experience the hustle and bustle of the city’s market where you can buy local produce and give in to the enticing aromas of the many food stalls. Just outside our area but always worth a mention Settle is easy to get to from our area either by car or train from Lancaster or Morecambe. There are lots of friendly cafés and pubs, a couple of fish and chip shops and a good selection of small independent stores where you can buy that perfect gift for that hard to please friend or relative. Settle’s market is mentioned in the Doomsday book and it is held every Tuesday come hail or shine. There is a small indoor market at the Victoria Hall along Kirkgate where you can enjoy a reasonably priced snack. Three large car parks are just a stone’s throw from the market square and are perfectly placed for a bracing winter ramble in the stunning Dales’ countryside. This pretty, small market town is a true mixture of old and new. Its historic buildings and medieval streets which are also known as weinds are set amongst contemporary, independent shops, restaurants and cafes. The main shopping streets are High Street, Bridge Street, Church Street and Thomas’ Weind. Since 2000, Garstang has become known as the World’s First Fairtrade Town, and in 2008 Garstang was voted the best town in Europe so why not sample its festive delights this season? Garstang has a weekly market every Thursday and has run since 1310! The Market House is also open Wednesday – Saturday and stallholders sell a good selection of local produce including cheeses, meats and vegetables. The Thursday market along the High Street offers a large selection of stalls including shoes, children’s clothes, household goods, plants, books and lots more. Where ever you decide to do your festive shopping, remember you can get just about everything you want for Christmas locally and you can enjoy visiting some of the prettiest festive shopping destinations of the season!